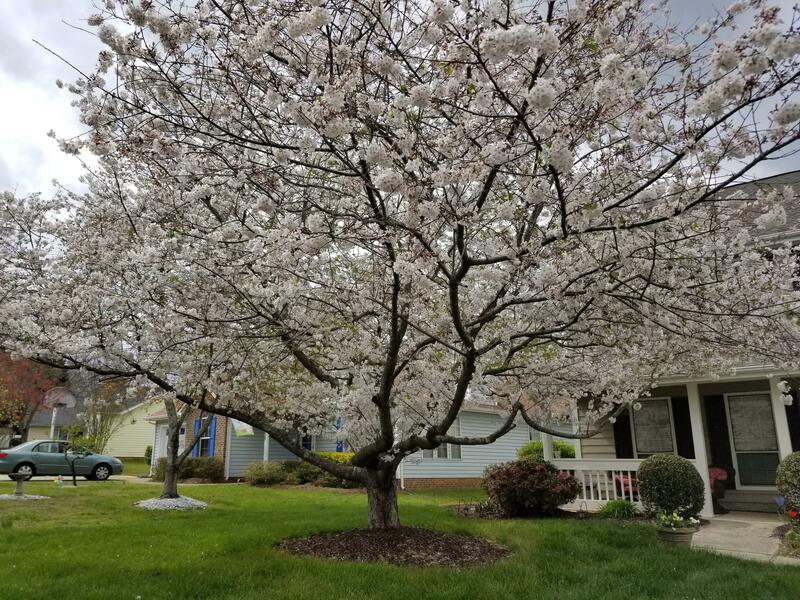 A Yoshino Cherry tree in east Charlotte is the 2019 Charlotte Tree of the Year. We Charlotteans love our trees, from majestic oaks to flowering fruit trees. When city officials and the people who care for those trees gathered for the annual TreesCharlotte summit Tuesday night, one tree stood out. The 2019 Charlotte Tree of the Year is a Yoshino Cherry. A photo shows the tree in springtime, with artfully spreading branches and pink blossoms, in front of the east Charlotte home of Tara Moore. Winners of the 2019 Crown Tree Awards at Tuesday's TreesCharlotte Tree Summit. From left, David Toro and Tara Moore, whose cherry tree was tree of the year; Charlotte Fletcher and Melanie Francis of Park Road Montessori School; John Marrino of Olde Mecklenburg Brewery; and Ernie McLaney of CROWN. "The first thing when we moved into our house that caught my eye was this beautiful cherry blossom in the front," Moore said. "And it was blooming at the time and I was super excited to see it. And I took a picture in the springtime and I kind of have been embracing that picture ever since I took it." There was a lot of talk at the summit about the thousands of trees lost in Charlotte every year to storms, age and development. But the Crown Tree Awards focused on special trees still with us. Moore said when the Charlotte Tree Advisory Commission announced the awards, she knew she had to enter. "So just by focusing on this one beautiful tree hopefully that'll get other people to really appreciate all of the trees that we do have here," Moore said. 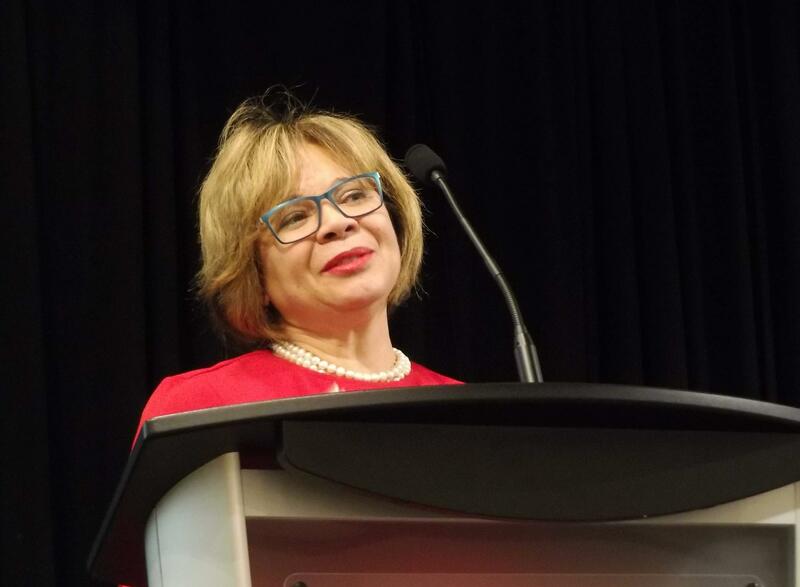 Mayor Vi Lyles handed out the Crown Tree Awards Tuesday night. Moore's photo inspired Mayor Vi Lyles, who judged the entries. She says it reminded her of school trips to learn about democracy in Washington, D.C.
"So I've chosen in honor of the cherry trees that we have in blossom when many times during the spring children go to our Capitol because we need it now," Lyles said. Another award, the "Spirit of the Tree," honored the relationships between trees and humans. The winner there also wasn't your typical Charlotte oak. It went to what you might call a climbing tree — a Deodar Cedar that's a focus of learning and play at Park Road Montessori School. CROWN, the Charlotte chapter of the N.C. Wildlife Federation, won the “Proud Partner of the Canopy Award." The organization helps homeowners turn their backyards into wildlife habitats. 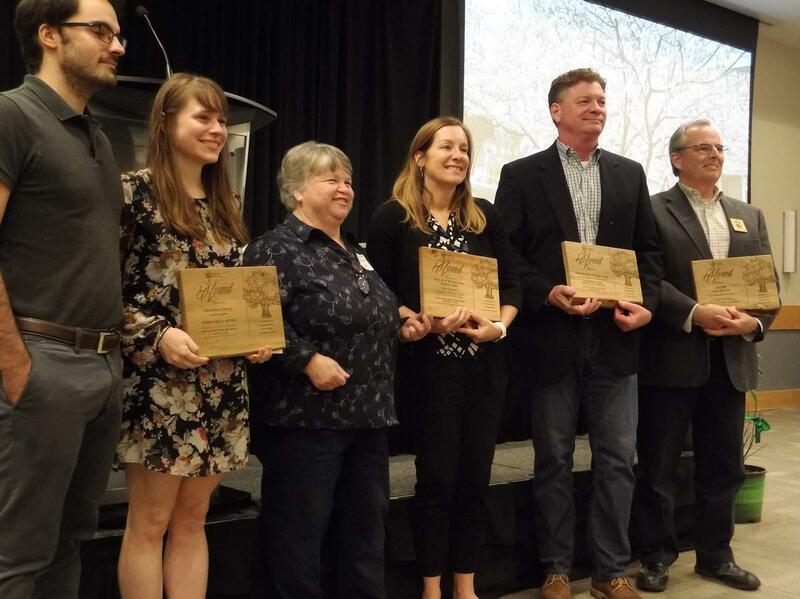 The “Corporate Friend of the Urban Forest Award” went to Olde Mecklenburg Brewery, for preserving an old oak named "Oaky" and replacing other trees lost as the brewery expanded. 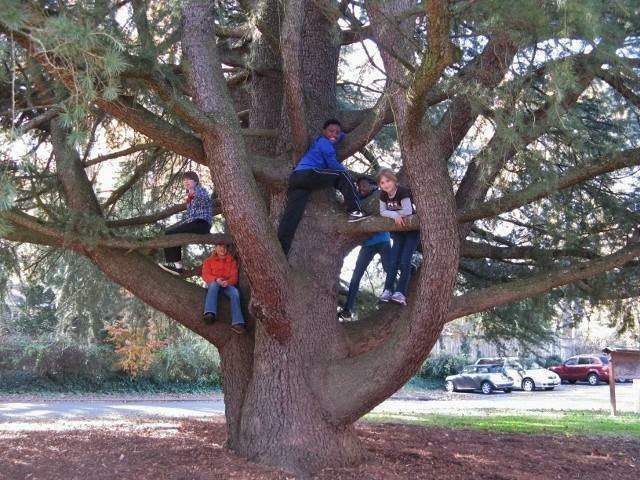 Children learn and play around the Deodar Cedar at Park Road Montessori School, which won the Spirit of the Tree Award. Charlotte arborists, city officials and tree lovers celebrated the city's efforts to preserve its tree canopy at the annual TreesCharlotte Big Tree Summit Tuesday. But a question loomed: Will it be enough? Charlotte neighborhoods have been a cacophony of chainsaws for weeks — since Hurricane Florence and then Tropical Storm Michael blew down trees and limbs around the city.